﻿Amanda Bouchet weaves an intricate story where Greek Gods are not myths but are revered and worshipped. Cat “Catalia” Fisa doesn’t see herself as a hero, even though she is distantly related to a God. From the moment Griffin locked eyes on her, he knew Cat was destined to change the world. Cat, known as the Kingmaker, wasn’t buying into that fantasy, and with the horror of her upbringing, figured that she was more likely to bring about the worlds destruction. But in Breath of Fire, she learns the truth about her heritage and the role her Gods are determined she’ll play in vanquishing her worlds darkness. 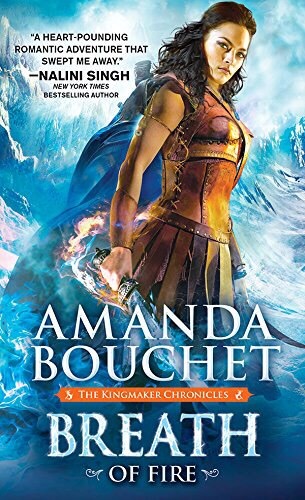 I love how Amanda Bouchet has artfully created another Greek heroine in the same vein as Hercules and Achilles. As with all heroes, the tasks she is given to complete are fraught with danger, but it is her love for Griffin and her friends and new family that gives her the courage to keep moving forward, facing mythological creatures as if they are every man’s backyard pet. Her c’est la vie attitude about the gifts she is given by Persephone, Hades, and the rest helps to make her story real, and not just one big fantastical tale. Both of the books in this series are in my top 10 favorite books this year. Her love affair with Griffin is so spine tingling, and her humility and fears are so real, that I was eager to turn every page while at the same time wanting to never get to the end of the book. Luckily, there will be a third book in this series to be released in 2017. If you haven’t read A Promise of Fire, the first in this series, pick it up, buy it, check it out. You will savor Ms. Bouchet’s writing style and fall in love with these characters just as I have. i received a copy of this book through NetGalley for my honest review﻿.